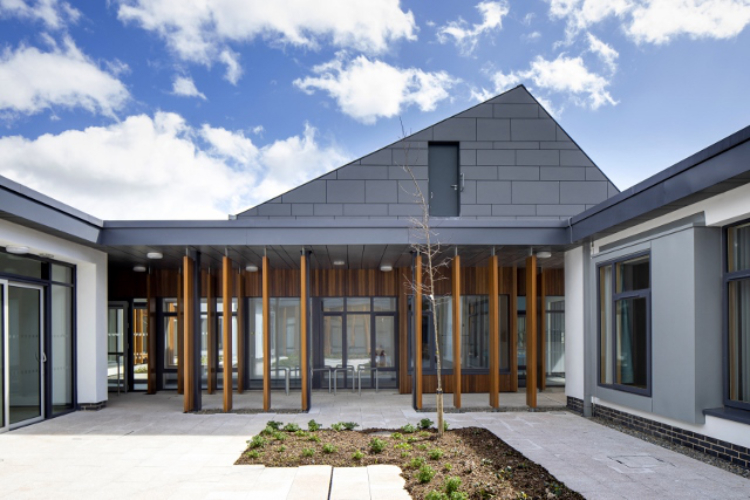 At first glance the £2.8million Rathview Mental Health Facility, Omagh, is not what you would expect. In fact, it would be hard to know it was a healthcare building at all. And that’s the point. Its height, whitewashed walls, slate clad appearance and rural setting all combine to lend it a homely domestic feel. 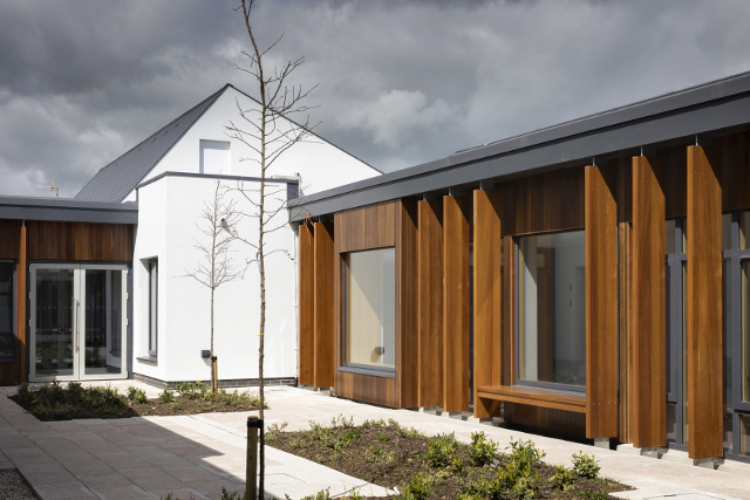 Completed in April 2018 for the Western Health and Social Care Trust, TODD Architects carefully designed Rathview to break down traditional, preconceived ideas of mental health facilities, offering a fresh, residential approach in a peaceful countryside setting. 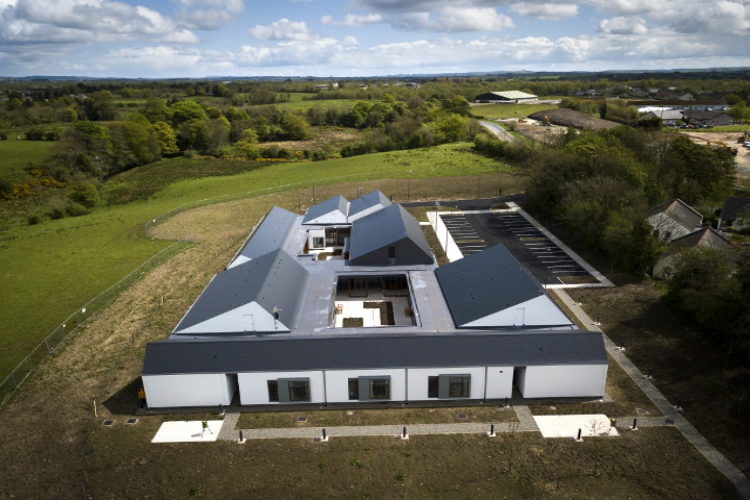 Situated a rural greenfield site on the outskirts of Omagh, the new £2.8 million, 1169m² facility contains a twelve-bed Discharge Unit and a six-bed Recovery Unit, arranged around two central courtyards. With its innovative design, the unit will increase the range of community-based mental health services, helping those with complex mental health problems on their path to recovery and independence. Deliberately one storey throughout, TODD’s shallow plan design places all habitable rooms on external walls, facing either directly out to the surrounding countryside or onto an internal courtyard, maximising natural light and views of a calm external environment. The Rathview Mews supported living unit focuses on rebuilding residents’ confidence and independence by providing a domestic environment. Twelve individual, one-person apartments are laid out around a central courtyard with two activity social spaces and a training kitchen. The six bed Rathview House offers short term care for clients, and the en-suite rooms are specifically designed to balance resident privacy with essential observation and access. Sensitively arranged around a fully enclosed courtyard, the unit includes staff accommodation and communal areas, including a social living room, a TV room, treatment rooms and an ADL room. 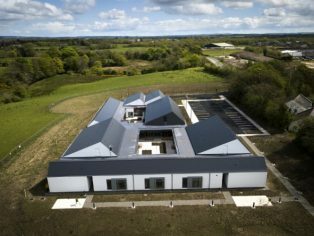 TODD’s design uses a series of pitched roof forms with flat roofed, predominantly glazed, circulation spaces to visually reduce the building’s mass and scale, helping it sit demurely in the beautiful Omagh countryside. This design also enhances client and visitor experiences by creating views ‘to’, ‘from’ and ‘between’ the internal landscaped courtyards and external surroundings. The restrained palette of materials has white rendered exteriors contrasting against grey slate roofs and wall cladding, with feature elements of brick and timber softening against aluminium framed windows. The cedar wood cladding of the internal courtyards offers a warm feel with glazed infills to encourage as much natural light as possible to flow into the interiors.